The Ambariya Muslim group in Tamale has donated large quantity of foodstuffs and assorted items to floods victims in the region. The items worth GH¢3.5 million are 505 bags of maize, 45 bags of rice, 10 bags of cassava, 10 cartons of cooking oil and six cartons of tomato paste. The rest are 83 bags of cement, 173 pieces of iron sheets, 645 used clothing and a number of new smocks as well footwear. Sheikh Zakaria Saeed who presented the items to officials of the National Disaster Management Organisation (NADMO) in Tamale said, it was part of effort of the group to assist alleviate the suffering of the floods victims in the region. Sheikh Saeed said it was prudent and the duty on every Muslim to help put smiles to the faces of the victims because many of them had lost almost all their properties and it was only proper to assist them overcome their predicaments. 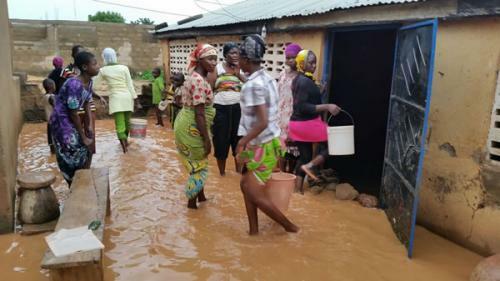 The Northern Regional Coordinator of NADMO, Abdalla Hindu, who received the items, commended the Ambariya Muslim group for the kind gesture, saying that the donation was the largest received from a non-government organisation or group, since the floods occurred in the region. Mr Hindu assured that NADMO would ensure that the items got to right beneficiaries, and appealed to other philanthropists and other organisations to emulate the shining example of the Ambariya Muslim group. Many of the victims were elated about the support of Ambariya, saying it had come at the right time since most of them were trying to reconstruct their homes. Mr Sayibu Dawuda, a victim, in an interview with the Ghanaian Times said the items would relief them of their challenges.